A group of Palestinian and foreign activists set up a memorial outside the European Union's main building in Brussels in commemoration of 4500 Palestinian victims killed by Israeli army in Gaza. 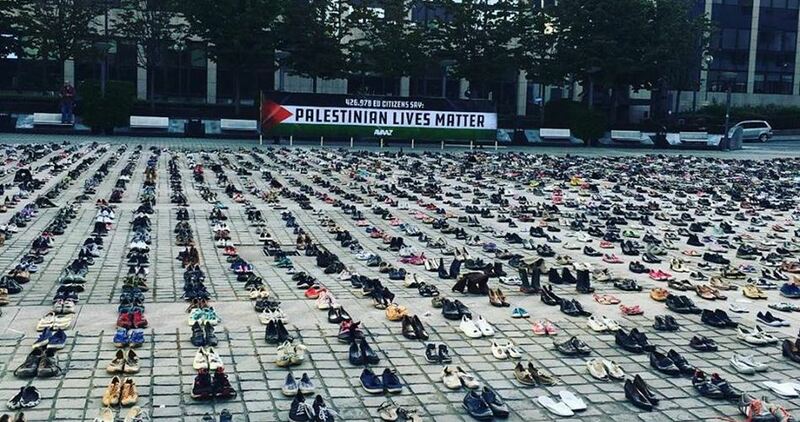 The activists lined up 4500 shoes representing the estimated amount of Palestinians killed by Israeli gunfire in Gaza Strip since 2008. The stunning display mainly aims to honor Palestinian victims and to shed light on Israeli ongoing crimes in Gaza Strip. Since 2008, Israel launched three devastating wars against the people of Gaza, killing at least 4500 victims and injuring thousands others, mostly children and women. 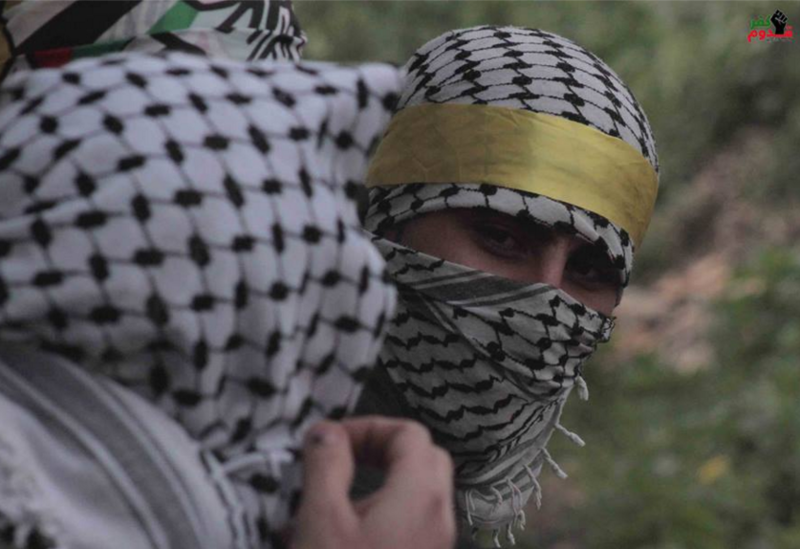 Dozens of solders surrounded, Friday, Kafr Qaddoum town, east of the northern West Bank city of Qalqilia, invaded it and attacked dozens of residents and international peace activists, causing many to suffer the effects of tear gas inhalation. The Popular Committee in Kafr Qaddoum said the protesters marched from the center of the village, this week marking the "Palestinian Martyrs Day"; many officials and local figures, participated in the procession. The protesters headed toward the fence of Kedumim Israeli colony, built on illegally confiscated private Palestinian lands. Israeli soldiers assaulted the protesters, and fired many gas bombs on them, causing dozens of suffer the effects of tear gas inhalation. The Committee stated that many soldiers hid behind Palestinian olive trees in an attempt to abduct protesters, but the residents managed to uncover their hideout and foiled their attempts. The invasion led to clashes between the soldiers, and dozens of local youths who hurled stones and empty bottles on the army. The soldiers fired many gas bombs, live rounds and rubber-coated steel bullets. 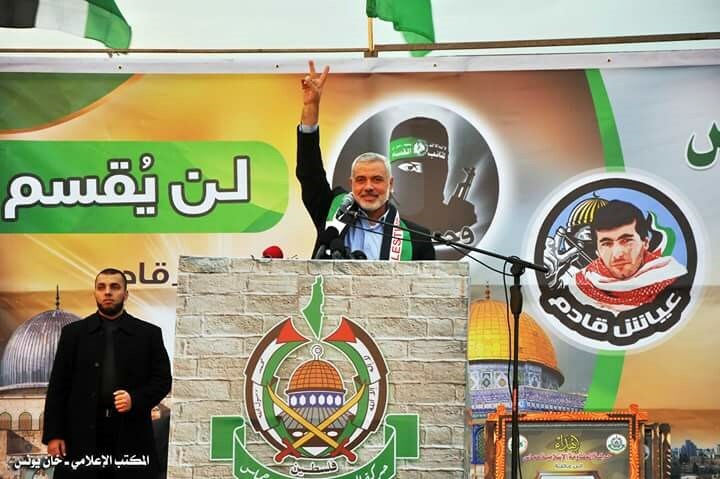 Deputy Head of Hamas Political Bureau Ismail Haneyya said that resistance is building its power in Gaza in order to liberate al-Aqsa Mosque and all of Palestinian territories. He stressed that Jerusalem Intifada has a lot more to demonstrate. In Hamas ceremony attended by thousands of Palestinians in Khan Younis on Thursday evening, Haneyya underlined that the Palestinian resistance and al-Qassam Brigades will astonish the world in any coming war of confrontation. He called on all Palestinians to support resistance. He affirmed that Hamas is seeking the liberation of Palestine from sea to river and denied the allegation claiming that his movement is looking forward to establish a state in Gaza. Haneyya perceived the Jerusalem Intifada as the greatest transform in the current stage which is so great to be ended or deviated from its track especially that it will mark its one hundred days on Friday. The Hamas senior leader hailed al-Qassam martyrs who detained the Israeli soldier Gilad Shalit in Gaza leading to the liberation of over a thousand of Palestinian prisoners in Israeli jails. He also recalled the Palestinian engineer martyr Yahya Ayyashh, assasinated by Israel 20 years ago on January, 05, 1996 which coincided two days ago. The ceremony was concluded by honoring the family of martyr Ayyash along with other families of al-Qassam martyrs in Gaza. Palestine on Saturday marked the 47th Martyrs' Day, a national day declared by late President Yasser Arafat in 1965. Muhammad Nahhal, an official in a Gaza-based association to help martyrs' families, says the day is an occasion to remember late leaders including Arafat, Hamas founder Ahmad Yassin, PFLP Secretary-General Abu Ali Mustafa and Fathi Shiqaqi, the founder of Islamic Jihad in Palestine. "Speaking about martyrs means speaking about Palestinian identity, Jerusalem, the Palestinian national project and about the most noble people who lit our path to freedom," Nahhal said. Arafat declared the national day after Ahmed Mousa was killed in 1965 in an operation in Eilaboun, a Christian village in the Galilee. 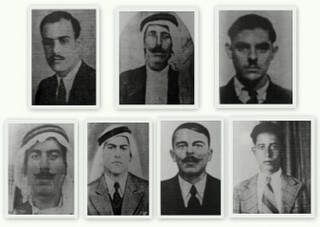 The mission was Fatah's first military operation in Palestine, launched days after the movement was founded. In October 1948, Palestinians were massacred in Eilaboun when Israeli forces raided the village during fighting to create the state of Israel.